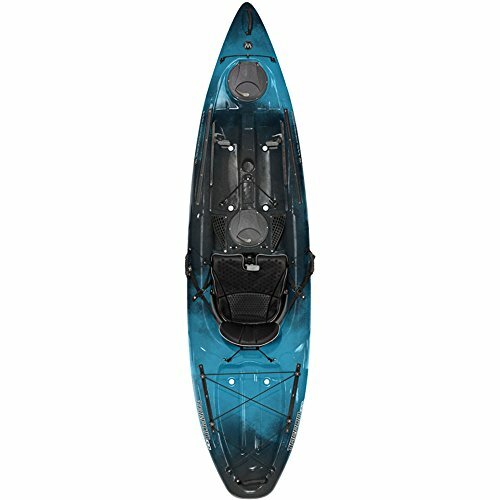 One of the first decisions that you will need to make when buying a kayak is whether you want a sit on top design or a sit in design. The reason that I tend to prefer the sit on top kayaks over other types is due to the versatility of these kayaks. They are great if you want to go fishing or even scuba diving because getting in and out of the kayak is not a problem at all. The following list contains a list of all of the best sit on top kayaks available. These kayaks share certain features which put them ahead of others. Primarily, this is the width of the kayaks, which as they are slightly larger, allow for greater stability. The durability of these vessels has also been taken into account which is a result of superior materials. Last but not least, these kayaks have plenty of storage options. What Is the Primary Use? The Ocean Kayak Frenzy is certainly a fuss-free model. It doesn’t offer anything more than the bare minimum in terms of storage or additional features. Despite this, it has earned its spot on the top of the list. This is because it is one of the more capable sit on top kayaks on the market. One of the reasons is that the kayak performs equally well in both, flat water, as well as when there are waves too. Also, the width of the vessel easily offsets the length, making this an incredibly stable kayak. The tracking and the maneuverability features on the Frenzy are also quite good. You will have no problem getting the kayak to go where you want it to. At the same time, there is no fear of the vessel being unnecessarily turned around due to the wind. I also like the fact that the vessel weighs under 50lbs which makes it a lot easier to lug around. Due to the short length, it will also fit in a variety of vehicles, making it ideal for traveling. It should be noted that this a strictly recreational kayak, which does limit the storage options. You can secure items with the deck bungee but this is more in the terms of smaller, lightweight equipment. People of average height will have no problem at all fitting in this kayak. However, if you are on the taller side, it may be a bit of a squeeze. 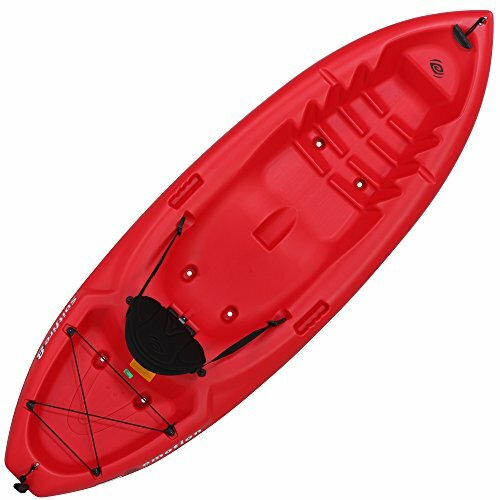 This kayak works well for individuals of all skill levels and will be a breeze for beginners to use. The visual appeal of the Wilderness Systems 100 kayak is not the only reason that it is on this list. This kayak what I would refer to as an all-rounder kayak. While it is functional and certainly has plenty of storage, it does not compromise on comfort. The comfort factor is largely due to the seat installed in the kayak. It offers excellent back support and even if you or the seat get a little wet, it is not a problem. This kayak works well for individuals of various heights. It’s got an XL Foot Brace system which makes it really easy to just push the braces forwards or backward, depending on where your legs land. Another advantage with this kayak is the considerable amount of storage space available. The stern tankwell is quite large, more than enough to store a bag there. Then you have the SlideTrax accessory system which allows you to add rod holders and other accessories if you want to go fishing or use it for some other activity. There are also small hatches with excellent lids and mesh gear pockets by your side. This means that none of the scupper holes are blocked and the water can drain away quite easily. This vessel does have good stability although it can be improved so that those on board can feel a little safer. Where the kayak does really come into its own is with the maneuverability –it is one of the easiest kayaks to manage. The kayak is quite lightweight, weighing a little over 42lbs. 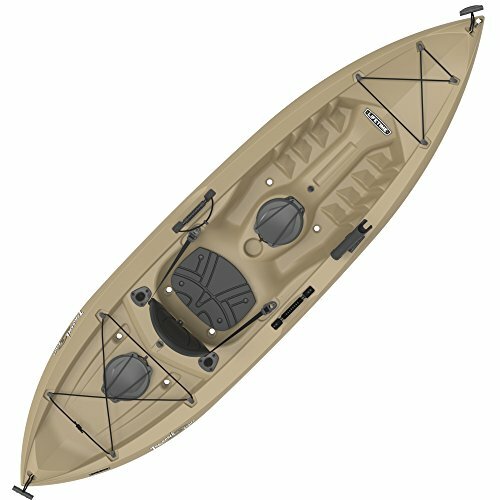 Lifetime Tamarack Sit-On-Top Kayak, Tan, 120"
The Lifetime Tamarack kayak is another one of those vessels that would work in a variety of situations. I found that it is equally good at covering distance as well as acting as a fishing kayak. The standout feature on this kayak is the level of durability. First off, it is made from high-density polyethylene that has also been safeguarded against UV rays. As a result, you don’t really have to be concerned with dings, peeling, or distortion to the vessel. It measures around 10 feet, which means that most people will be able to fit quite comfortably in the kayak, without issue. There are various footrest positions to make sure that different heights are catered to. 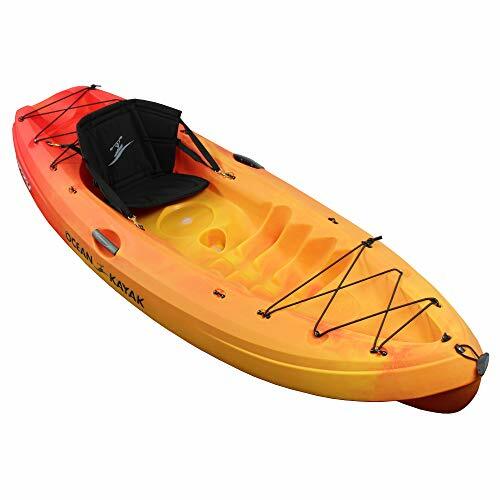 This is kayak is a definite must-buy for fishing enthusiasts as it comes fully equipped. There are two types of rod holders – flush and top mounted – that are already attached. There is also an incredible amount of storage space. There are two areas in the front and the back as well as a hatch to keep your things dry. In terms of stability, the Tamarack falls in the mid-range. You certainly won’t fall over but it’s best not move around too much while standing up. As mentioned, the Tamarack is made from some heavy duty material, therefore it is a little heavier than some of the other kayaks. If I had to dock a point or two, I would do it because of the seating. While it is relatively comfortable, it gets less so the longer you stay on the kayak. The Lifetime Emotion 90224 Spitfire is by far the cheapest model on this list. 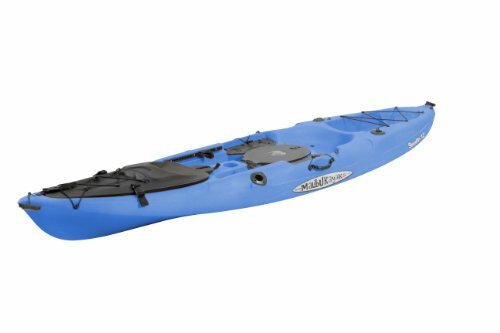 Therefore, if you are looking for something that won’t break the bank, you will find that this kayak fits your needs perfectly. While it may be affordable, the manufacturer certainly hasn’t skimped on the quality. The vessel is made from high-density polyethylene and has been protected from UV rays as well. It is also capable of carrying around 240lbs, despite weighing just over 40lbs. It should be noted that the Emotion is just eight feet long. While it will fit the average passenger well, those who are taller or have longer legs are going to find this vessel problematic. Even though it isn’t very long, the Emotion still makes good use of its space. There is a small storage area behind the passenger where you can keep a small bag and other items. The length of this kayak has one other effect on its performance and that is with the tracking. There is a limit to how well this kayak tracks, especially when it is windy. The stability, however, is quite commendable. The backrest is also a nice touch which does help the kayak to be a little more comfortable. Given the size of the kayak as well as how easy it is to manage, I would recommend this for children looking for a kayak. Rear Tankwell with Bungee Lacing for Storage. The Sun Dolphin is one of the most preferred sit on top kayak brands and with the Sun Dolphin Journey, it is easy to see why. At ten feet long, this has got plenty of leg room for most. There are adjustable foot braces so that you can modify it to suit your particular height. Also, because of the design of the vessel, you can feel quite secure in the kayak. One thing that you will not be lacking in is places to stow your stuff on your kayaking trip. There is a portable accessory carrier at the back where you can store a variety of items. There is also a bungee rigging if you want to secure longer or larger equipment. It is a great kayak if you like fishing, too. There are two flush mount rod holders and one swivel holder. Also, the padded backrest makes it a bit more comfortable on those longer journeys. Due to the way that the height and width of the kayak are balanced out, the stability is actually quite good. Where this kayak falls short is the tracking, particularly when the vessel is meant to be still. This is where it can interrupt your fishing plans in a windy situation. When at a stop, the vessel has a tendency to move in the direction of the wind rather than remaining at rest. The addition of a rudder could help overcome this, nonetheless. The Malibu Kayaks Stealth 12 is undoubtedly one of the most stable kayaks here. This is largely due to the width of the beam which stands at 33 inches. The vessel is certainly kitted out for this purposes. There is plenty of space to store a variety of gear. Also, for the fishing enthusiast, there is a center bait tank system onboard. There is a casting platform which makes it a lot easier to fish from. There are four rod holders, combined – two in the back, two in the front. Another one of the impressive features on this kayak is the tracking. Even on open water, it tracks well. One of the criticisms regarding this kayak is the space. Although it is over twelve feet tall, a great deal of space has been dedicated to storage. This means that taller people may be at a bit of a disadvantage here. The kayak is also heavier than most which doesn’t make it the easiest vessel to cart around. 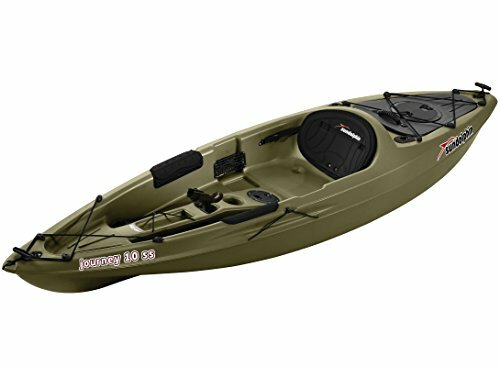 The extra weight is offset by the fact that the kayak is capable of supporting up to 450lbs in weight. People prefer sit on top kayaks for a couple of reasons. For some, due to physical impediments, they can find it difficult to get in and out of the vessels. Therefore, sit on top kayaks make sense, since you don’t have to worry about jumping in or out of the kayak. At the same time, these individuals are going to require a great deal of stability. It is their physical limitations that would make it quite dangerous for the kayak to capsize. If this is your reasoning, you will need to find a kayak that is relatively wide so that you are afforded greater stability. Then there are others who prefer such kayaks due to their chosen activities. These are often fishermen and scuba divers. If these are your hobbies, you are going to need to need to get on and off the vessel quite often. While stability is certainly important, you will find that tracking and storage options are of greater concern to you. To improve tracking, you may want to use a kayak with a flatter hull – recreational designs tend to sport this feature. Make sure that the kayak in question has plenty of space to store and carry your gear and equipment. The most common material to construct commercial kayaks out of is polyethylene. However, not all types of polyethylene are the same. There is the single layer polyethylene that is also known as linear poly. This is a decent option as it is durable and it performs quite well too. Unfortunately, this material is quite heavy and is also prone to damage if it continuously exposed to UV rays. If you are willing to pay a bit more for quality, then you can get a kayak that is made from high-density polyethylene. Despite the higher price tag, it does offer up several advantages. For instance, it is a lot lighter than its counterpart. Therefore, if you plan on carrying your kayak from one place to another, you want the vessel to be made out of this material. The other benefit is that the high-density polyethylene is a great deal more resistant to UV rays. While you may be paying more, your vessel will certainly last you a lot longer. You will typically find that kayaks meant for just one person tend to range between eight feet and twelve feet. The length of a kayak is important for a couple of reasons. Kayaks that are longer tend to be faster but they can be a little more difficult to manage. In contrast, the shorter kayaks are much easier to handle but don’t really pick up speed. Size can also matter when thinking about how much leg room is available to you. This is particularly important to taller individuals who may have a harder time finding kayaks that accommodate them. This cannot be determined by looking at the overall size of the kayak, nonetheless. This is because depending on the design and the purpose of the vessel, the space that has been created for your legs will vary. Therefore, you should calculate how much seating area there is to figure out if you will fit. In terms of the seating area, you should also check the width of this space. Some of these kayaks can be quite narrow which can be problematic for those with a wider or larger build. Due to the nature of sit on top kayaks, seats are not always a fixture. Some models have them while others don’t. Even if you don’t require a padded seat, you should still pay attention to the backrest. This is because the length and the size of the backrest can impact your paddling. Backrests that are higher are more comfortable and provide more support. At the same, this can result in a difficulty with paddling. Therefore, higher backs are not suitable for those looking to cover distance within a short period of time. This guide contains what you need to know if you are looking for a sit on top kayak. You will need to pay attention to all of the details and features pertaining to a kayak. This is what will help you determine whether it is pertinent to your requirements.